“Michelle Obama is unlike any other First Lady in American History. From her first moment on the public stage, she has challenged traditional American notions about what it means to be beautiful, to be strong, to be fashion conscious, to be healthy, to be First Mom, to be a caretaker and hostess, and to be partner to the most powerful man in the world. What is remarkable is that, at 52, she is just getting started. Barack Obama made history by becoming the first African-American President of the United States. Of almost equal significance was Michelle Obama’s becoming the first black First Lady. Just as her husband undoubtedly inspired a generation of marginalized youngsters to believe that they could achieve anything they set their minds to, Michelle was a transformative figure in her own way, including the way she helped the world appreciate black beauty. Because of the high visibility of her position, almost single-handedly, she managed to successfully challenge the culture’s narrow definition of beauty based on European features. For this and myriad other reasons, Michelle was embraced by fellow black females. 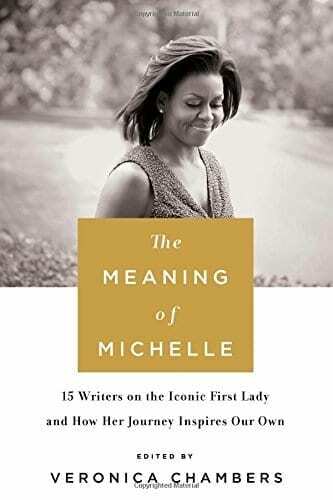 And many of them are delineated in The Meaning of Michelle, a reverential retrospective acknowledging a debt of gratitude owed to a much-beloved icon. Edited by Veronica Chambers, the book is composed of 16 essays by a variety of admirers, each accomplished in their own right. One, Chirlaine McCray, is even a First Lady, being married to New York’s Mayor, Bill de Blasio. A priceless keepsake positioning for posterity Michelle Obama as a positive role-model for the ages.